Delicate balance represents the fragile relationship between people and their natural environment. The cube-shaped sculpture represents an architectural intervention in the landscape; its shape, purposely geometric, controlled and inorganic. The form is in flux, in a state of change, as the centre of the cube is visually disintegrating and transforming into another form. With this new sculpture, Rob wanted to celebrate change, embrace the elements and invite the natural forces to assist in the re-shaping of the artwork. The very fragility of the structure addresses the question of how we function in a naturally changing world. Do we try to control and overpower nature with engineering and technology or do we accept our limitations and understand that nature has a cycle of birth, death and re-birth and that we must develop a more symbiotic and sustainable relationship? Rob spent nearly a month in Cheng Long working with his volunteer assistant, Wan Jung Cheng, cutting and forming thousands of pieces of split bamboo into the finished sculpture. They were fortunate to have help from the local villagers who really contributed to the project, learning new techniques and sharing the creative process. Bamboo is an amazing material. Throughout the build Rob welcomed both villagers and visitors, explaining the concept of the sculpture. It was also a good opportunity to discuss their lives in Cheng Long; how they farmed the fish, clams and shrimps in their pens which surround the village and how the changing weather in the wetlands of western Taiwan was affecting them in their daily lives. 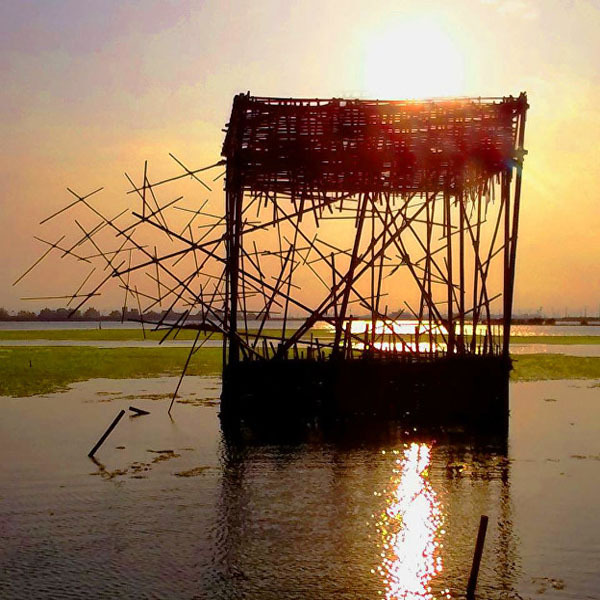 It's striking to see the visual effects all around the village with semi -submerged houses and to consider how the rising sea level has impacted on them in such a short time. During Rob's visit to the DZNE Headquarters in Bonn he was particularly struck by the similarity of the function of the building to a functioning brain: full of subjects and passages, linked together to create thoughts and ideas. The scientists within the building represent the receptors and axons. They conduct tests, develop new ideas in their laboratories, and communicate these creative ideas to their colleagues. Like the signals of the neurotransmitters of our brain, each individual thought and dialogue is linked, transmitted through the whole building, and in continuous interaction. The front entrance elements of the sculpture represent brain waves, a visual metaphor of the way in which information is absorbed by seeing, hearing and feeling. The partly reflective surfaces absorb the changes of light and colour throughout the day and the seasons, capturing the world like a sense cell. The pulse shapes refer to the DZNE logo and strengthen the identity of the building. They extend into the main building to create a connection between the exterior and interior space. Disc-shaped stainless steel elements in the floor of the entrance hall and on the side wall area symbolize neurotransmitters. They carry our thoughts out into the open space towards the outer space at the other end of the building. Outside the discs merge with the main sculpture element, undergoing a physical transformation, morphing into a solid mass. 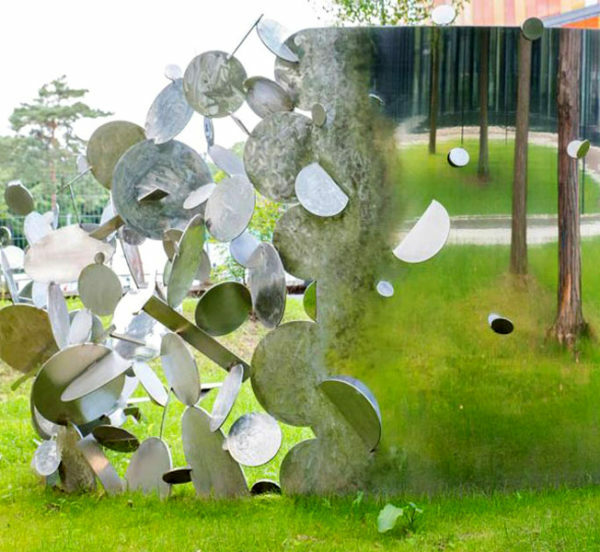 By connecting the neurotransmitters to a firm and tangible structure, the main sculpture reflects the concept of regeneration into a visual metaphor for healing. The surface of the curved section of polished stainless steel reflects the surrounding architecture and nature. As a positive future prospect for the treatment of neurodegenerative diseases, this section represents awareness, enlightenment and the possibility of thinking again. Thus the sculpture encapsulates the philosophy of DZNE by following the journey of translational research.